I have frozen beans from my garden many times. Each time I go to cook them though, there is this 'film' that sloughs off them. I heard somewhere that there are certain variety of beans that do not do this. Any suggestions? 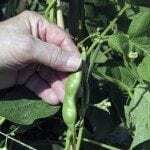 Have the best luck with "Provider" for green beans and "Gold Rush" for yellow beans. Usually get seed from Veseys. I've read that the round podded varieties are best. Don't know if it's true or not. We prefer the variety Derby.